We’re all about thinking outside the box. When it comes to text marketing campaign development, we encourage you to do the same. Here are a few different restaurant text marketing campaign ideas. Obviously, make sure each campaign is tailored to your menu and diner preferences, but beyond that; go ahead and have some fun. You want diners to see your menu as diverse and complimentary. If your waitstaff is on their A+ game, they should be able to rattle off wine pairings with every single dinner entree. Why not push these pairings? This encourages top of mind awareness the next time your patrons stop in. Show this text for a complimentary 6 oz glass of wine with any full priced entree. Sweeten the deal a bit with text to win contests that scream luxury. Don’t do a generic, boring gift card giveaway. Get creative. How about an after hours Valentine’s Day dinner for two, prepared by our in house chef? Text LOVE, winner announced Friday at 2PM. As a restaurant owner, you know the sales potential behind weekend events. Capitalize on this opportunity with text message marketing campaigns that promote your menu and events. John Mayer will be here Friday night at 8PM for an exclusive, acoustic set – our treat! Show this text for front of the line access. We cap at 50. 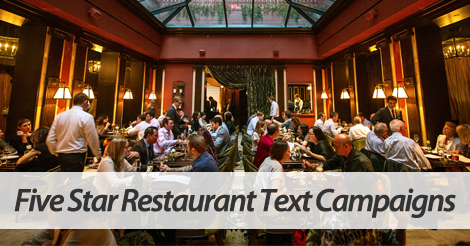 Join forces with the top restaurant text marketing provider, SlickText.com. Give us a buzz at 1.800.688.6290 to learn more. Want to skip the call, and get started now? Head over to our pricing page, and sign up for a free plan. Just so you’re aware, our free plan is free forever. We don’t believe in free trials. We want every single restaurant owner to feel comfortable growing at their own pace.